Product Spotlight: Enterprise Reporting - Dashboards Added!!! Earlier this year, Prolink added a new concept in monitoring to the Enterprise Report Scheduler called Dashboards. Dashboards are similar to QC-CALC SPC's Monitoring feature in that they continuously monitor data as it is uploaded to the database. However, they take the concept further by providing a wealth of new tools. Below is a list of available features. Each dashboard has customizable widgets that are placed onto your personal dashboard surface (drag/drop). Each widget is configured with its own data source and customizable visual characteristics. 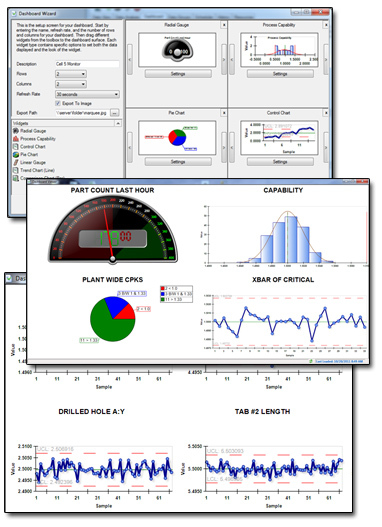 You can create as many dashboards as desired allowing you to monitor various areas of the plant or multiple plants. Dashboards can be set up to refresh at various intervals in order to stay as current as necessary. Dashboards can be set to export to an image file (such as JPG, PNG, BMP) on refresh. This allows you to automatically update your internal intranet/portal websites, scrolling visual factory marquees, etc. Download the latest version of the Enterprise Report Scheduler from our website at http://www.prolinksoftware.com. Tip: Too Many Spec Plans? Launch them via Bar Code Scanner! If you have a lot of spec plans, you have no doubt run into issues keeping them all organized. You can group them in folders but that takes a lot of organization. How about bar code scanning instead? 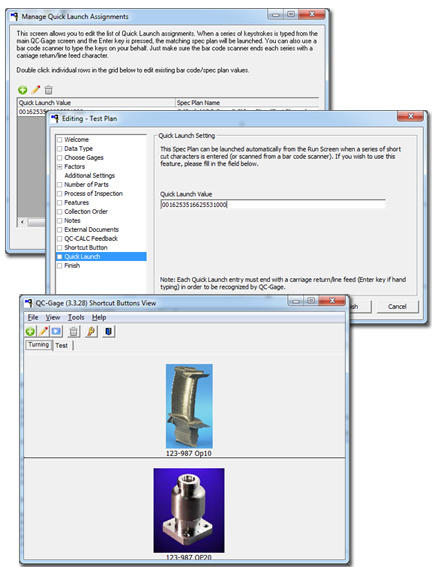 QC-Gage 3.3 now has the ability to launch the correct spec plan based on a bar code or other combination of keystrokes. Since bar code scanners are so cheap these days, it makes it an easy way to call up the right spec plan without forcing your operator through a myriad of folder levels to find the right part number. Most bar code scanners are simple keyboard emulators that plug into a USB port on your computer. We purchased a cheap $200 scanner on ULine, plugged it in, and it began working immediately. The only requirement for using the scanner is that it terminates each scan with a carriage return/line feed character (equivalent to the Enter key on your keyboard). In the Spec Plan wizard, there is a new screen called Quick Launch. This is where you enter the bar code or other quick launch sequence (it can be typed if you wish) for that particular spec plan. Make sure the main QC-Gage screen is highlighted in Windows. Then just scan your bar code or type the sequence followed by an enter key. Your spec plan will launch. If you already have a lot of spec plans and don't want to edit each one individually, simply scan a bar code. QC-Gage will tell you it doesn't recognize that bar code and allow you to choose a spec plan. After choosing the plan, it will both launch the plan and associate the quick launch sequence you used for next time.